Brown beaded macramé bracelet. With a button! It’s been a long, long time since I used Macramé to make things, so I thought I’d make a beaded bracelet. I had some strong cotton yarn lying around from an old knitting project that I could use for my cords. As for beads to add, my stash had these round, brown wooden beads with splashes of green and blue, and they were perfect for this project. 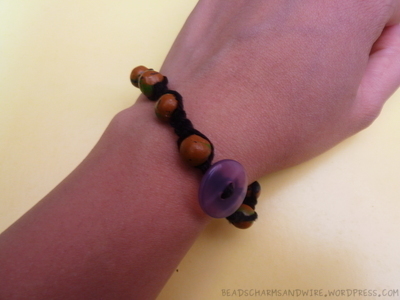 The bracelet was almost 7″ by the time the last bead was used, and I made 4 more square knots. I then borrowed a translucent violet button from my sister’s stash. I fastened this button by stringing both working cords through it and tying up the working cords and filler cords below the button. Finally, I snipped off the extra yarn from the cords. 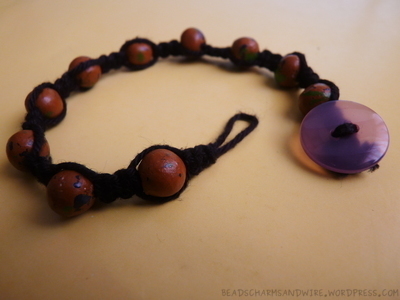 This entry was posted in Bracelets, Buttons, How-tos, Jewelry and tagged Black, Brown, Cotton yarn, Handmade, Macramé, Round beads, Square knots, Violet, Wooden beads. Bookmark the permalink.